The ‚Engländer‘ (‚Englishman‘) is a german slang word for an adjustable wrench tool, also known as a monkey wrench. Fittingly this ingenious tool was modernized by a swede: engineer and inventor Johan Petter Johansson (1853 – 1943), who also invented the classic pipe wrench. But from a design point of view, we are much more excited by his work lamps, which he produced from 1919 on in his own factory TRIPLEX. 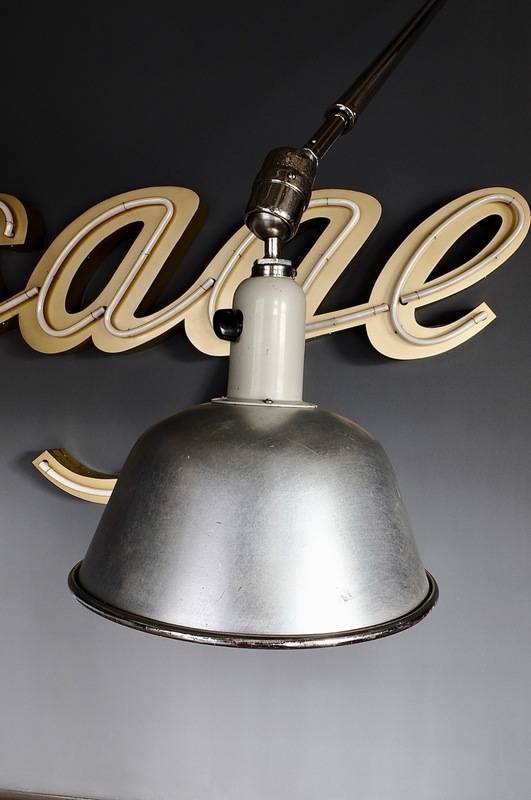 Our model, a Telescopic Triplex Lamp from around 1940, can be swivelled into any imaginable position and stays there. The articulated arm is 96 cm long, if you pull out the two telescopic arms inside, the lamp reaches a length of approx. 260 cm. Thanks to a ball-and-socket joint, the aluminium shade can also be rotated in any direction. Our Triplex was completely disassembled, cleaned, greased and the electrics, including grounding, brought to current safety standards. Along the way we found out that this really is a genuine Swedish design: To tighten the nut on the cable reel housing, you need an 18mm wrench. This is the size everyone who drives a vintage Volvo knows very well.